After the dramatic scenes at City Airport last night, it now turns out this was the second British Airways CityFlyer incident at the airport this month. Erk. On 5 February a flight from Glasgow damaged its nose-wheel on landing, resulting in the runway having to be closed. Yesterday's flight from Amsterdam... damaged its nose-wheel on landing, resulting in the runway's closure. The latest incident was a lot more serious (Mark Myers - or should we call her Suzi Brent now? - at Nee Naw was on duty last night when the call came in) but still not life-threatening; the aircraft's slides were used to evacuate passengers and the plane is reported to have actually lost its front wheels. Although the same type of plane was involved in both incidents - Avro RJ-100 - it wasn't the same actual plane involved twice. BA are also in the process of replacing the CityFlyer fleet with Brazilian Embraer 170 and 190 planes. No connection, we're sure. 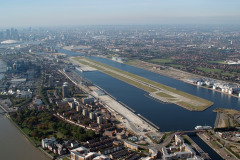 City Airport does have a short runway and it's possible pilots were trying to make sure they didn't end up in the water by doing “hard landings” that went wrong. Something else to consider for the Thames Estuary proposals?